A short, readable book that explains clearly and simply what the Bible says about doubt and assurance. Many Christians experience times of doubt and uncertainty. At various times we can ask: Does God love me? Am I really a Christian? - and even Is there a God at all?! This short, readable book unpacks the difference between good and bad doubt, shows us where it comes from and how to deal with it in ourselves and others. 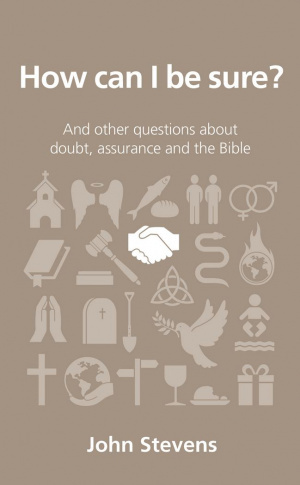 It explains clearly and simply the liberating reality of what the Bible tells us about doubt, assurance and the Christian life. How can I overcome doubt as a Christian? How can I develop a confident faith? How Can I Be Sure? by John Stevens was published by The Good Book Company in July 2014 and is our 20124th best seller. The ISBN for How Can I Be Sure? is 9781909559158. Reviews of How Can I Be Sure? Be the first to review How Can I Be Sure?! Got a question? No problem! Just click here to ask us about How Can I Be Sure?. Details for How Can I Be Sure?